The Royal Aircraft Factory was formed in England in 1911 from the HM (Her Majesty's) Balloon Factory and among its designers was Geoffrey de Havilland who later founded his own company, and Henry Folland - later chief designer at Gloster Aircraft Company and founder of his own company Folland Aircraft. Between 1911 and 1918 the Royal Aircraft Factory produced a number of aircraft designs. Most of these were essentially research aircraft, but a few went into mass production, especially during the war period. Some orders were met by the factory itself, but the bulk of production was by private British companies, some of which had not previously built aircraft. The B.S.1 of 1913 was a one-off anomaly, combining both systems: Bleriot (tractor) Scout (fighter). The B.E.2 was designed by Geoffrey de Havilland and first flew in February 1912 with de Havilland as the test pilot. On 12 August 1912, it set a new British altitude record of 10,560 ft (3,219 m). It started production as a reconnaissance machine, and two years later formed part of the equipment of three squadrons. These were all sent to France shortly after the outbreak of war. The early B.E.2a and B.E.2b aircraft were replaced during 1915 by the B.E.2c. In late 1917, the last front-line B.E.2e was withdrawn, long after the type was obsolete. It continued in service throughout the war as a home defence fighter with surprising success, and also as a trainer. Some 3,500 B.E.2s were built by over 20 different manufacturers: an exact breakdown between the different models has never been made, although the B.E.2c was almost certainly the most numerous. In Australia, the newly formed Central Flying School at Point Cook started with two officer instructors and a few mechanics. The first military flight in Australia took place on 1 March 1914, and the first training course began in August with four student pilots. The first four military aircraft ordered for Australia in July, 1912 were the RAF B.E.2a CFS-1 and CFS-2 and were supplied as advanced trainers along with the two Deperdussin ground trainers, while a fifth aircraft, a Bristol Boxkite CFS-3 for basic training was ordered in December 1912, with all five aircraft eventually arriving and being stored in Spotwood before delivery and erection at Point Cook, although the B.E.2a aircraft were last to arrive. The two B.E.2a aircraft were supplied and built under contract by the Bristol and Colonial Aeroplane Company and some delays were incurred in their construction due to modifications and testing at the Royal Aircraft Factory at Farnborough. The first was flown on 15 October 1913 by Geoffrey de Havilland and the second was flown by Wingfield Smith on 17 November of the same year before being shipped to Australia on the S.S. Hawkes Bay and arriving on 3 February 1914. The honour of the first flight at Point Cook went to Bristol Boxkite CFS-3, with Lt Eric Harrison at the controls, on March 1, 1914. The B.E.2a was only used for advanced flying training at Point Cook, with the bulk of the training being undertaken in the Bristol Boxkite, (one of the Deperdussins CFS-4 crashing within days of its first flight and the other, CFS-5, being relegated to ground training). Only two of the first four pupils in the August 1914 course, Williams and Merz, were permitted to fly solo in the B.E.2a. One of the CFS B.E.2a aircraft become the first Australian Military aircraft to serve overseas when it was crated and shipped to German New Guinea on 30 November 1914 on the HMAS Una, along with a Farman Waterplane to assist in the campaign to sieze German forces in New Guinea following the commencement of WW1. However as it turned out neither aircraft was uncrated or used, and both returned to Point Cook early in 1915. The two B.E.2a aircraft remained in service for all eight pilot training courses held at Point Cook up until 1917. CFS-1 was demolished in a crash in 1918 and CFS-2 retired in the same year following the arrival of D.H.6 trainers. In 1916 the CFS also recieved an incomplete B.E.2c and it was eventually put into service in 1918 as a B.E.2e CFS-18 when the balance of parts arrived. The B.E.2a differed substantially from the later B.E.2e as the earlier aircraft relied on wing warping controls whereas the later aircraft was fitted with conventional ailerons on the wings. 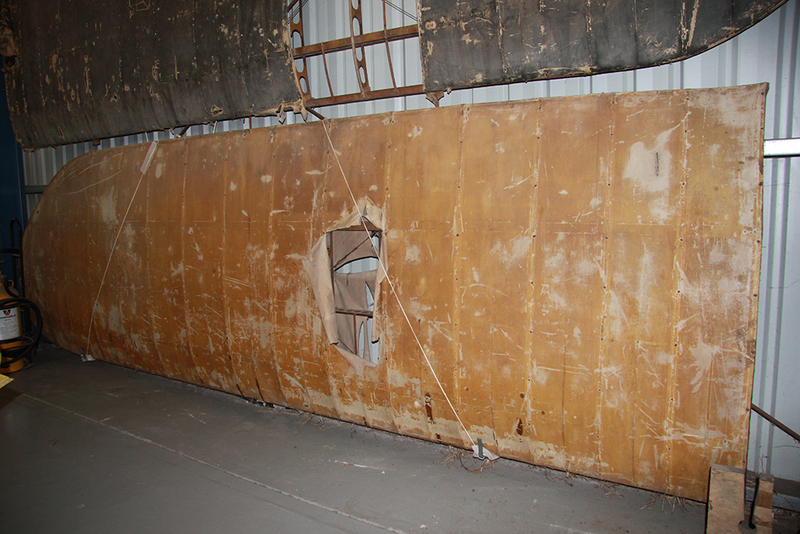 The Museum's B.E.2a wings are a pair of upper mainplanes or wing panels without ailerons, These artefacts came into the museum's possession in 1967, having been discovered in a shed at a house at Newport, Victoria, by an AARG member, from a lead by a local enthusiast. They finally went on display in 1992, having been stored in a garage belonging to an AARG member's father for the previous 25-year period. They are almost certain to be sourced from the Central Flying School at Point Cook, as no other B.E.2a aircraft were ever brought to Australia.. It may well be possible that CFS-2 and some remains of CFS-1 were given to Melbourne Technical College (RMIT) on their retirement in 1918 from Point Cook, and a B.E.2 type is reported as being in the possession of Melbourne University in 1921, however the fate of those remains, or any link to the Museum's wings is unknown. It's debatable as to whether the Museum's BEs' wings were built to a slightly narrower chord as a one-off modification to cope with the wing failure issue. It is known that all BE variants had a wing chord of 66 inches. 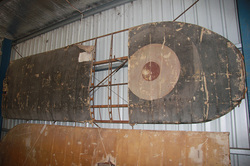 On display at Moorabbin are a pair of wing panels, one an upper port plane and one an upper starboard plane, and ostensibly belonging to the BE2s that served at CFS. One wing is finished in original military markings with roundel, while the other is unmarked as if repaired with new fabric or new unused, it is not possible to determine which aircraft they were fitted to, or if they were additional spare wings purchased with the original 2 aircraft or later during the 1914 to 1917 operations. The following commentry appeared in the AARG's Spring 2012 Insight Magazine, and was provided by Mr Andrew Willox, an AARG member, BE2 Researcher, and constructor of a BE2 reproduction now on display at the RAAF Museum at Point Cook. Andrew used the AARG BE2 wings and Kelly & Lewis (Renault V8) Engine as references for his project, along with extensive research of original drawings, photographs and overseas references. The BE2s flown by the Army’s Central Flying School as CFS1 and 2 were unique amongst all BEs when they were built at Bristol and remained probably the only ones in the world to have retained the unequal span NPL3a aerofoil section, when all other BE2s had, from May 1913 onwards in perhaps the world's first aviation 'recall', either been retrofitted in the field or manufactured as-new with the later RAF6-section equal span wings. Even the erstwhile prototype BE1 – the first ‘modern’ aeroplane – was eventually upgraded to a BE2b with this modification, serving at various times with Nos 2 and 4 Squadrons RFC. It is thought to have survived until 1916 but much of the original woodwork had probably been replaced. The two early-variant BE2a's that flew at Point Cook were more related to the original BE1 than any other variant. The rather primitive aerofoil section they utilized possibly came from Gustave Eiffel’s work in simply checking the developments in aerofoil design that French aviators such as Blériot were employing. Finding them completely viable this work possibly found its way to the National Physical Laboratory in London from where it became NPL3a. NPL had a close link with the Royal Aircraft Factory as they had been undertaking experiments for them with a wind tunnel that was, for its day, one of the finest available. Its secret was that its fan sucked air through the tunnel, being situated behind the test subject, giving a ‘cleaner’ airflow, in comparison to the one at the Factory that blew air against the subject. The Royal Aircraft Factory then utilized the resulting data from NPL. NPL3a was almost certainly used for BE1 and the very early BE2/2a variants. One of these two wings appears to have been fitted to an aircraft while one appears to be a spare but, importantly, they both have a chord of 64 inches. A reduction of two inches in chord over the total wing area amounts to a loss of under 12 square feet. On a trailing edge thickness of about a quarter of an inch, this would have produced a negligible effect on lift, especially on a 'training' aircraft not required to carry a military load. It should be noted that at this time a 'military' load on a BE2a comprised a heavily dressed observer sometimes armed with a cavalry carbine or a Colt automatic and a limited amount of ammunition, and even this modest additional load could produce an unfavourable effect on the aircraft's performance. The wings at Moorabbin appear to have not been 'butchered' to achieve this reduced chord – the woodwork is well fitting although there is some shrinkage due to age. Much debate has occurred about the provenance of these wings, with some debunking their authenticity on the grounds that they have a chord of 64 inches, and other issues such as the spar centre distance. I have inspected and measured these wings and taken photos of the spar stubs, which clearly display manufacturers' and inspection stamps. The British aviation historian Mr Paul Hare attests that at least one of these stamps is British and my own research in locating two relevant, original plans from the British National Archives by which to build my own BE2a, clearly shows an identical wing structure and details as described in drawing A1194 dated April 1912. Discussion regarding spar centres was published in Insight July 1992 as 2’7½”. The spar centre distance for NPL3a, RAF4 and RAF6 is exactly 2’7”. This is marked as so on the plans I am working to and it is important to remember that at least one of Moorabbin's wings does appear to have been rebuilt at some time, possibly as an apprentice exercise, as the rib spacing is irregular and the authenticity of their internal reconstruction should not be trusted in this instance. I am, however, left with no doubt that they could have been successfully fitted to CFS1 or CFS2. It is impossible to check further as to the authenticity of these wings because the General Arrangement plan A1193 to go with A1194 is missing from the archive sequence. The proximity of the nose webbing on each major rib to the leading edge par at Moorabbin is much closer than specified on another plan – A1419 dated June 1912 – and Moorabbin’s wings are probably a genuine glimpse at the original NPL3a design. I have no doubts, now, as to the authenticity of Moorabbin’s wings and am happy to ‘stick my neck out’ with this claim. The discovery of the plan: Army Aircraft Factory, Wood Parts for Main Planes, A1194 confirms much of their construction and therefore we have, possibly, the only remaining examples of the NPL3a aerofoil. The B.E.2a wings on display at the Australian National Aviation Museum at Moorabbin are the only surviving remains of the B.E.2a type in Australia, are the earliest Military aircraft components in the museum collection, and are the only other original aircraft components surviving in Australia from the five original 1914 CFS aircraft, beyond the complete Deperdussin CFS-5 held in the collection of the Australian War Memorial.